Monday was a fine and blustery spring day, a perfect time for a little hope and renewal. And, not to be too rich about it, that seemed to be the mood inside the Kate Buchanan Room at Humboldt State University, where about 150 faculty, staff, administrators and students gathered at noon for a public forum to talk about change. At the head of the room in a long line of chairs sat a cabinet of 13, plus HSU President Rollin Richmond. This was, in fact, the Cabinet for Institutional Change, formed late last year after a devastating one-two punch -- first, a report from the Western Association of Schools and Colleges (WASC), the body that accredits HSU, which noted systemic fragmentation in decision-making on campus and was so doubtful of the university's ability to pass the accreditation review that it was put off for a year; second, the infamous Keeling Report, from New York consultancy firm Keeling & Associates, which described a campus culture so far sunk into organizational dysfunction and depression, from the president on down, it'd take a dozen Dr. Phils to bring it around. Plus, there was the state budget crisis: The already bare-bones university, facing millions in cuts, had to find a way to avoid the vital organs and major arteries. Interim Provost and Vice President of Academic Affairs, Bob Snyder sitting next to Richmond, noted some of the high points from the WASC report -- including the observation that one of HSU's historic strengths has been its focus on sustainability and caring for the planet. But, yes, there were loads of problems. The cabinet, split into teams, would tackle five areas for comprehensive reform: university vision; student success; campus governance; collegial, respectful and responsive community; and a culture of evidence. Undergraduate nursing student Beth Weissbart admitted she felt anxious about the area of focus she and astronomy Professor Dave Kornreich would be coordinating, "collegial, respectful and responsive community," saying it wasn't "very focused" yet. But she did know that, among the student body, even people who hadn't heard of the WASC and Keeling reports could "feel that something's not right on campus." Weissbart, however, sounded determined to make the change process inclusive, and certain that things were going to get better. Others spoke likewise, and from the sound of their enthusiasm this wouldn't be yet another university undertaking that ends up bound and languishing on a shelf somewhere. This, as cabinet member Matt Johnson, a Wildlife professor, told a group after the meeting, was really "going to shake things up." The key, they all said, was that the cabinet wasn't going to work or make decisions in isolation -- everybody on campus could participate. HSU has made other recent strides toward inclusiveness. In late February, the Program Prioritization Task Force released its final report to Interim Provost Snyder. Last Friday, the deans of each department submitted to the provost their recommendations based on the report. And Snyder, using these recommendations and the report, likely as early as this Friday will make his own recommendations on which programs to enhance with resources, and which ones to eliminate or restructure. 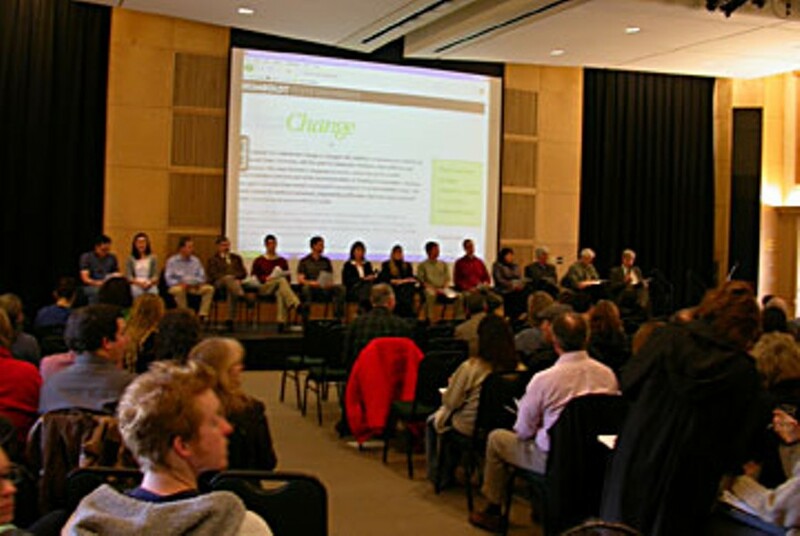 Snyder formed the task force back in late 2007 as a means to align the university's programs with its vision of being the diverse, citizenship-oriented, community-engaging, go-to campus for people who want to make the world a better place, study the environment and natural resources, make art and engage in social and environmental action. It also would connect resource allocation with university-wide strategic planning, something WASC wanted the university to do, Snyder said. It was the first time the university had undertaken to evaluate its programs against each other. The faculty-filled task force took data and reports from department staff and professors and used it to rank program majors, minors and options based on such things as vision, demand, quality, revenues and potential. It also placed them into five categories -- 1, targeted for enhancement (resources); 2, to be maintained as is; 3, to be reviewed further; 4, to be restructured or eliminated; and 5, to revisit once already instituted changes have had a chance to take hold. Top rankers included Wildlife, Geography, Biology, Political Science, Engineering, Economics, Mathematics and Sociology. Bottom rankers included Criminal Justice (minor program); German Studies (minor); Chinese Studies; Computer Science; Liberal Studies -- non-teaching; Computer Information Systems; Interdisciplinary Studies; and Physical Science. Some bottom rankers, said Snyder in an interview last week, such as the Latin American studies minor within the Spanish program, had "really struggled with low enrollments for years." The dean of the College of Arts, Humanities and Social Sciences, Kenneth Ayoob, said in his memo to Snyder Monday that the department of World Languages and Cultures had "agreed to eliminate the Latin American Studies Minor." Other low-ranking programs were either redundant, or simply didn't fit well with the vision, said the task force. For instance, it suggested that some majors, like Physical Science (as opposed to Physics) and Liberal Studies-Non-Teaching, appeared to be escape valves, "easy mechanisms to allow graduation for students who lack direction or struggle for more than two years to identify a major." "It is unclear what kind of support such programs should receive or indeed whether they are appropriate at a high quality academic institution like HSU," said the task force report. The dean governing Physical Science recommended elimination; the faculty response to the report, however, noted that the program is a good major for secondary school science teachers not wanting to pursue the more rigorous BS or BA in Physics. And what was wrong with offering an escape valve, the faculty wondered -- at least those students would graduate. Deciding who gets money and who gets cut or restructured may sound like the hardest task. But the middle-ranking programs -- the ones up for further review by their departments, and even some of the high-ranking ones slated for as-is maintenance -- could present more long-term challenges. Nursing is one of those up for review. An expensive program, it has enough serious issues that some on the task force wanted to suggest eliminating it. "I don't anticipate eliminating the nursing program," Snyder said. "One of the challenges for the nursing program here is, we have a BSN program, and College of the Redwoods has an RN program. But both of those programs require clinical placements in order to confer those degrees. Because we have so few hospitals in the area, there's a real limit to the size of the program, because there's only so many clinical placements." But, he said, there's a critical need nationwide for nurses -- College of the Redwoods and HSU will just have to better coordinate their programs to make them complementary, not competitive -- something that Nursing Chair Rich Paselk, in an interview last week, said is already happening, along with efforts at fixing its other issues. "We're in the midst of tuning up," Paselk said. And so it has gone, lately: agreement in some areas, disagreement in others, shifting and adjusting. The point is, everyone seems to be talking and making the big decisions collaboratively now. Indeed, judging by the claps, smiling nods and thank yous after some of the Change Cabinet members' speeches on Monday, things do seem to be looking up. Although, there were notes of caution that also received applause. Marlon Sherman, professor of Native American Studies, told the cabinet that while they aimed to look to the future, they also needed to look back and heal the wounds from years of infighting and organizational collapse. "Remember, there are people on this campus, the walking wounded, and you need to acknowledge them," he said. After the forum, Sherman said he hasn't seen any "sweeping effort" at the university to really nurture diversity. "There's been no effort to teach people how to communicate, or to teach sensitivity training," he said. His own program, which fits squarely in with diversity goals, was middle ranked by the prioritization task force and targeted to be maintained as is -- and, as it is, the department is short two and a half instructors, with just two full-time professors and a part-timer to teach the 40 majors in the program and other students, Sherman said. "Our program has not been supported for eight years," he said. "I'm afraid this means business as usual. And [so] we don't teach the depth that we want to do." But, stepping out into the spring-blossom air Monday afternoon, Sherman turned hopeful. His program, he said, really needs a Native American House on campus, where students can meet each other. Such students struggle, across the country, to stay in college -- they miss the close community they had growing up, Sherman said. "The ranking will hinder us," he said. "So we'll just have to step outside and look for private funding and do it on our own time. But I don't mind that. It's for the students. We are going to have a building."